In the past, home audio systems were kept in separate places in the house like the stereo, radio, TV, a smaller TV were all kept in various locations in the house, with little or no connection between them. Currently, in modern homes, almost all electronics are wired as a single and integrated system. 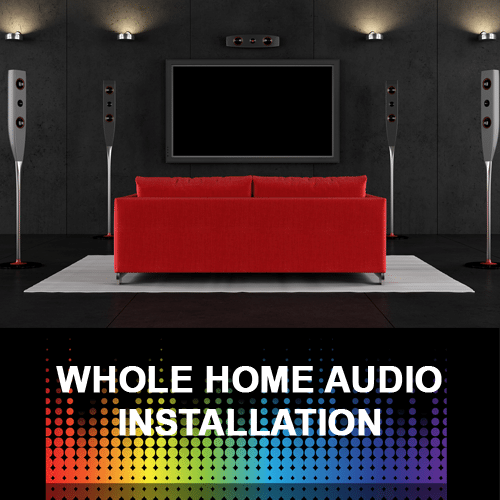 Multi-zone audio or whole-house audio is an audio system that is centralized and controlled in any area of the home. What this means is that a whole-house audio system is able to play the same music source in every area of the home, whether from a radio, CD or iPod. Speakers are found in each room, and the sound is controlled in some way. It can have a simple control that adjusts the volume or an extensive control that allows you choose stations, songs or playlists, etc. it is important to note that the whole-house audio can only play one source of music at a time. For example, if your grandfather is playing jazz CD, everyone in the house is stuck to listen. A multi-source capability is added to the advanced whole-house systems; this feature enables each listener select their choice of songs independently. For example, mom can listen to the news in the home office; the children can listen to the music on an iPod upstairs and Dad can play his CD in the den. Each room has its own system control with source selection, the touchscreen or wall-mount keypad is the most popular style of zone control. The system is operated through the light switch-sized panel that is small and has keypads used as regular buttons. The touchscreen makes use of the LCD screen that is touch sensitive and has buttons electronically displayed on the screen. Most times they are installed in locations that are accessible and convenient. This feature enables users to decide what they want at any time they want it. Whole-House audio systems can also be operated with a wireless remote control; this adds flexibility and convenience to audio systems. There are a variety of configurations and styles that are available to Whole-house audio system. The audio system differs in the amount of zones and sources that are available at time. For example, a five-zone, five-source system can play five independent sources in five different rooms but for a large family living in a big house an eight-zone, eight-source system would be more suitable for all the rooms. The whole- house video systems make videos and can be incorporated into your home. The major advantage of this system is that all your video sources are centralized. All the viewers in the home can share cable converters, Digital Video Recorders (DVRs), satellite or receivers. Each of the televisions found in the house is controlled by similar remote controls, keypads, and touchscreens when whole-house audio is combined with video and also the sound and picture for each television are controlled by similar controls. This system has an advantage of being easier to use; this is because it only has one control. Your home’s air conditioning, heating, ventilation and other systems found in the home can be integrated. The HVAC can also be controlled by same touchscreen and keypads that are used for controlling video and audio. This allows you to make any system adjustments from any room, plus the system can also be automated making it more economical and effective. From time immemorial, this audio system has been in existence, but there have certainly been some improved changes. Recently, multi-room audio systems are better sophisticated in design and function, unlike in the early days, where speakers are connected to a stereo system, and then these speakers are installed in other rooms with separate controls for the volume. In this way, it saves you the stress of running into other rooms in order to adjust the volume of the speakers. This was not a sophisticated solution, but it was serviceable. The central HVAC (Heating, Ventilation, Air Conditioning) system has become increasingly popular in modern homes. It has replaced separate room heaters and air conditioners making systems more energy efficient and sophisticated. There are some similarities between the central HVAC and the Multi-room audio systems, because of the centralization of the audio system instead of separate systems. The only thing installed in different rooms is the controllers and speakers. A multi-room audio system has two main advantages. First is the fact that it helps prevent clutter and saves space that separate systems would occupy in the home. They are also operated differently, for example turning on the television in one room can be greatly different in doing the same in another room. Nobody needs the extra chaos, life is already tough enough. The centralization of all your music content is the next advantage of this system. It is much easier Downloading songs and albums of your favorite artists in on a computer which is a lot convenient and fast than running to purchase it from a shop. Once those songs are stored on the computer, you can listen to them in various rooms in the house. All the downloaded music are played by the multi-room audio system whenever and wherever you want. Even, some Premium Internet music providers like SIRIUS/XM® stream, Rhapsody® or Pandora® allows you to customize any music content of your choice without downloading them. This provides users with endless access to incredible library of songs. Presently, there are many available multi-room audio systems in the market. Our system designers’ are of vast knowledge and experience as they provide you with Sound Advice on some exceptional multi-room audio systems that are the best choice for you. We look forward to hearing from you, just contact us and we will be of assistance to you at anytime.